Keneric Healthcare’s RTD® sponges are amazing and my doctor was pleased with the healing progress. I can’t thank you enough for helping my little arm heal. Hugs to you both!! The wound is a venous ulcer on the right shin of 56-year-old male with severe venous disease and type II DM.The first picture is from 11/13/15 when the wound was first discovered. The wound was about 3 cm in diameter, with necrotic tissue. Minimal purulent drainage, no odor. Leg was edematous from toes to mid-thigh and painful. Patient was started on IV and oral antibiotic. 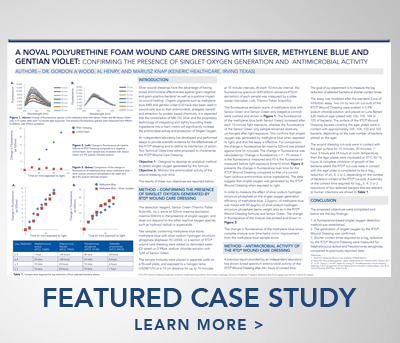 Wound was mechanically debried, RTD® foam applied directly into the wound bed and 2 layer compression wrap was applied from toes to mid-thigh. Dressing remained intact until 11/17/15.Second picture is from 11/17/15. Wound was approx. 2 cm in diameter, well profused bed. Minimal serous drainage, no odor. 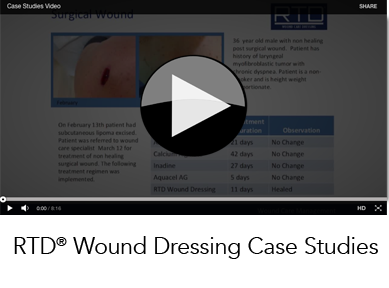 Wound was cleaned, RTD® reapplied and leg re-wrapped. IV and oral antibiotics continued.Last picture is from 11/24/15. Wound was completely healed up with scar tissue. Small area still open to the side where RTD® was not originally applied.